There are more than a million members of the RSPB: very few call themselves birdwatchers. There are many more people who put out food for the birds: they do so out of love for the birds but would shy away from the title of birdwatcher. How do you become a birdwatcher? Look out of the window. See a bird. Feel a moment’s pleasure and you are a birdwatcher. That’s it. The rest is only a matter of degree. Today's birdwatchers are a powerful force for nature conservation. 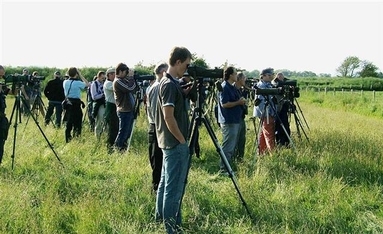 The number of people interested in birds rises continually and it is vital that birdwatchers take seriously their responsibility to avoid any harm to birds. Birdwatchers must also present a responsible image to non-birdwatchers who may be affected by our activities and particularly those on whose sympathy and support the future of birds may rest. Some points to bear in mind. Welfare of birds must come first. Whether your particular interest is photography, ringing, sound recording, scientific study or just watching birds, remember that the welfare of the bird must always come first. Habitat protection. Its habitat is vital to a bird and therefore we must ensure that our activities do not cause damage. Keep disturbance to a minimum. Birds' tolerance of disturbance varies between species and seasons. Therefore, it is safer to keep all disturbance to a minimum, particularly in the breeding season. Breeding birds. In terms of the Nature Conservation (Scotland) Act 2004 disturbance at or near the nests of birds is a criminal offence. Rare migrants. Rare migrants or vagrants must not be harassed. If you discover one, consider the circumstances carefully before telling anyone. Will an influx of birdwatchers disturb the bird or others in the area? Will the habitat be damaged? Will problems be caused for or with the landowner? The Law. The bird protection laws, as embodied in the Nature Conservation (Scotland) Act 2004, are the result of hard campaigning by previous generations of birdwatchers. As birdwatchers, we must abide by them at all times and not allow them to fall into disrepute. Respect the rights of landowners. The wishes of landowners and occupiers of land must be respected. Always follow the Scottish Access Code. Respect the rights of other people. There are many other people who also use the countryside. Do not interfere with their activities and, if it seems that what they are doing is causing unnecessary disturbance to birds, do try to take a balanced view. While flushing gulls when walking a dog on a beach in winter may do little harm, in the breeding season, the same dog would be a serious disturbance to nesting shore birds or a nesting gull colony. When pointing this out to a non-birdwatcher, be courteous, but firm. The non-birdwatchers' goodwill towards birds must not be destroyed by the attitudes of birdwatchers. Keeping records. Much of today's knowledge about birds is the result of meticulous record keeping by our predecessors. Make sure you help to add to tomorrow's knowledge by sending records to your local recorder. Then there are twitchers ! The Concise Oxford Dictionary lives up to its name when it calls twitchers "bird watchers who try to get sightings of rare birds". For lurking within that one-line description is the twitcher who hired an aircraft and pilot to fly along hundreds of miles of coastline on the off chance he’d spot a Spectacled Eider duck, and the scores of twitchers who regularly put jobs, mortgages and marriages on the line in pursuit of something that has probably flown away by the time they get there. In Orkney, there was a very rare Oriental Turtle Dove. On the first day after the report of the sighting, there were 27 car-loads of twitchers on the ferry, four charter flights from England and dozens on scheduled flights - one extremely portly enthusiast spent over £500 on adjoining seats to ensure his place on a busy flight. "Bizarre" was one of the kinder descriptions given by a local resident to the sight of a couple of hundred twitchers with tripods in pursuit of a dove desperately looking for peace. Rest was not forthcoming. In the space of ten days around 1,000 twitchers came and went. The very rare turtle dove went, too. Another twitching story, this time re a wedding. The twitcher had just cleared the legally binding stage of the proceedings, when his bird hotline paged him with the news that a rare shrike from central Asia had been reported in a Dorset village. The wedding was in Bedfordshire. "I’m nipping home to change my suit," he informed his new bride - and headed off for Dorset, turning up at the reception four hours later. "It was a ‘once in a lifetime’ bird. Birds don’t give you warning and you’ve just got to go when it happens. There was nothing I could do about it." He declines to elaborate on what followed. Suffice to say that as far as that relationship went, like the rare bird, its days were numbered.